The top Ethiopia historical and heritage tours include Lalibela, Bahrdar, Gondar, Axum, and Harar. His-Cul Ethiopia Tour Operator provides an overview of historic Ethiopia. Sightseeing tour visits more than 12 sites including rock-hewn churches and monasteries which were established several hundred years back. Our history tours help you to explore Ethiopia’s birthplace, taking you behind the scenes to the places where other tours cannot venture. We invite you to take your time to stroll through the museums of Ethiopian history and also learn more about the top historic points of interest in Ethiopia such as but not limited to Lalibela, Gondar and Bahirdar. ATTRACTIONS OF AXUM: Travelers’ Ethiopia tours will not be completed without Lalibela, Axum and Bahrdar sightseeing. 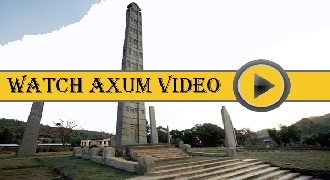 Let’s briefly see what the attractions of Axum include. In the small garden at the entrance to the town, a long inscription in three types of scrip, South Arabian, old-Ethiopian, and Greek, presents to a visitor a page from the history of Ethiopia. It tells of a campaign undertaken by King Ezana to bring his unstable or confused neighbors. Ezana is said to have been its Constantine, having introduced Christianity to Ethiopia. suffices to gain an understanding of a past two thousand years old. There are at Axum monuments of the pre-Christian period; the most famous are the great sculptured steles. One of them 23 meters tall, stands in the center of the town. The biggest lies on the ground in pieces; it measured 33 meters. Four more steles are broken, lie on the ground a little to the north of others. All these steles are monoliths of granite, which abounds in the region. At the Axum steles, one can easily see doors, windows with frames, and beam heads. They are obviously reproductions of multi-storied buildings. 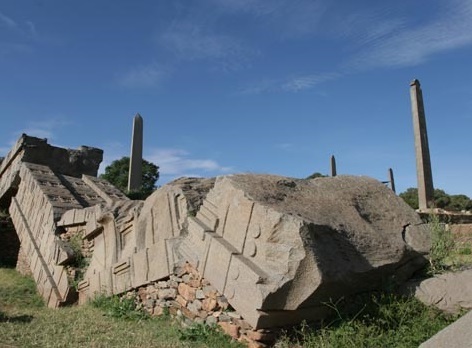 Most reliable sources place the steles of Axum in the third century and the first part of the fourth century A.D.
Another important attraction of Axum is tombs of important persons of ancient times which are located some distance away on the hill which dominates the city to the northeast. Tradition recognizes among them the graves of kings of the sixth century, Kaleb and Gebe Maskal. It is not without interest to note that the Church of St. Mary of Zion has itself been superimposed on the walls of an Axumite construction whose interior is fixed to a pillar on the right and beautiful paintings of uncertain date: a Madonna typical of the Ethiopian style. The palace of the Queen of Sheba and the swimming pool Queen of Sheba had been using are also some of the most important attractions one can see while he is in Axum or in his Ethiopia tour. The sixth century temple of Yeha, one of the most famous sites of ancient Ethiopia and the cliff-top Monastery of Debre Damo also can be covered in a day trip either from Axum or in your way from Axum to Mekele or from Mekele to Axum. BAHIR DAR: Bahir Dar is the best lakeside city of Ethiopia. The region is the home of the Amhara, whose language has become the lingua franca of Ethiopia. 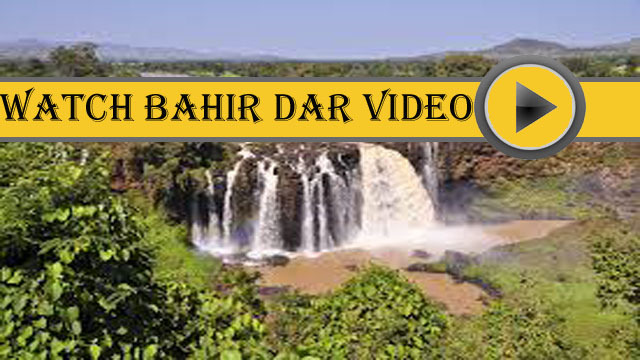 Bahir Dar with colorful flowers and wide and palm-lined streets is located at the extreme south of Lake Tana, the major source of the Blue Nile, the longest river of our planet. Bahir Dar is located 578 km northwest of Addis Ababa, and its average altitude is 1,840m above sea level. Bahir Dar also enjoys a tropical type of climate, with an average temperature of 17.5 degree Celsius. fourteenth century during the reign of Emperor Amda Tsion who ruled Ethiopia 1314-1344. A number of excellent historic and interested monasteries which were built in the fourteenth century have been sheltered on the islands and peninsulas of Lake Tana. The number of monasteries on Lake is 30. 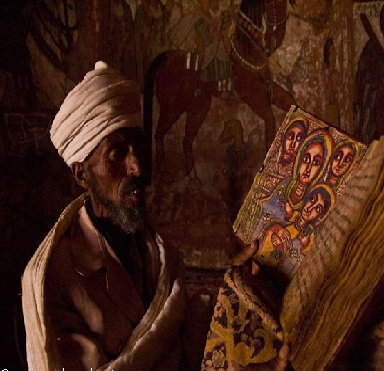 Church crosses, beautiful and well preserved ancient mural paintings, ancient illuminated manuscript and former kings’ clothes are some of the most important things one can see in his visit of the monasteries at Bahir Dar. In addition to the ancient monasteries Bahir Dar has sheltered, the Blue Nile Falls, Ethiopia’s most magnificent waterfall is another attraction of the place. 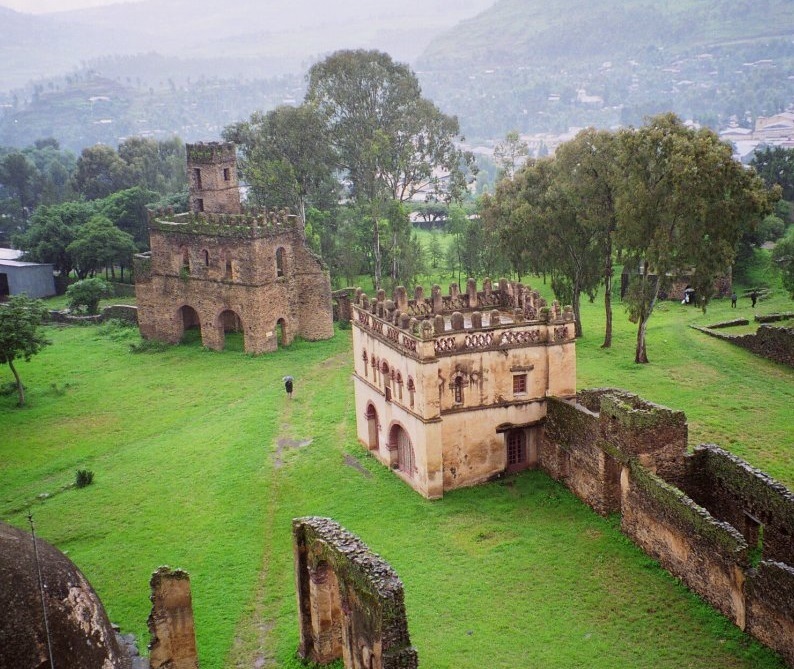 THE 17th CENTURY CASTLES OF KING FASSILADA AT GONDAR :Emperor Fassiladas, one of Ethiopia’s rulers of the medieval period is remembered for the establishment of Gondar as his capital around 1636. His successors, Emperor Yohannes I (1667-1682), Emperor Eyassu I (1682-1706), Emperor Dawit III (1716-1721), Emperor Bakafa (1722-1730) and others after them found the new political center so agreeable that it remained a permanent seat of imperial power until the middle of the nineteenth century. Ethiopia thus came to have once again, after the mobile capitals of the medieval period, a fixed capital. Gondar was thus able to repeat the magnificence of its predecessors, Axum and Lalibela, in lasting architectural achievements. Red Sea coast and Matamma on the Sudan border. This commercial importance continued even more after 1636. The Gondar market was a meeting point for people from the Lake Tana region and Wagara, who traded their cattle, honey, butter and grain for the urban product of the weavers, blacksmiths and goldsmiths. A place in the outskirts of Gondar city was reserved for the Falasha people who dominated the crafts. 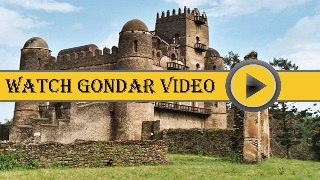 It was during the reign of its first kings that Gondar experienced above all its period of glory and splendor. These kings were King Fassiladas, Emperor Yohannes I (r. 1667-1682), and Iyyasu I also known as Iyassu the Great (r. 1682-1706). Empress Mentewwab, wife of King Bakafa (r. 1721-1730), continued the glorious Gondarine tradition of building beautiful palaces and churches. Attractions in Gondar: Travelers can see the following attractions in Gondar on their Ethiopia tours to north Ethiopia. The Castles of King Fassiladas: These castles were built by King Fassiladas around the mid of the seventeen century. The castle has 12 gates indicated in Roman numerals. The palace is a two-story building made up of Basalt stones. He used eggs and mortar instead of limestone to fasten the basalt stones. The swimming pool of King Fassiladas, his son’s library, Emperor Dawit II’s house of song and Emperor Bakafa’s banqueting hall and reception are some of the other attractions one can see near the ancient Castles of Gondar. One will have a chance to see many other Gonderine structures outside the city. Qusqwam Palace and Church complex: The Qusqwam Palace and Qusqwam Monastery were built by Empress Mentewwab. The palace and the church complex is a good example of this architectural achievement. The churches in particular were famous for their beautiful paintings, crosses and other refined works of art. Fallasha Village: The Fallasha village which is roughly located one kilometer out of the city is also another attraction. One can see there their villages and ruins of old synagogues. Fallashas are Judaic Ethiopians who practice Judaism. the several levels where the churches in a group are set on, the trenches that serve as a drainage system and the roof’s ridge are some of the many examples that can prove the superior architectural knowledge of the architects of Lalibela. A good example for this is the construction of the 11- Rock Hewn Churches of Lalibela that have been recognized by UNESCO as part of the World Cultural Heritage. Lalibela is the most beloved sightseeing of many Ethiopia holidaymakers interested to see ancient historic places. The 11-Rock Hewn Churches of Lalibela is one of the most harmoniously designed complexes of the ancient times as well. The first group of the churches includes Beta Medhanealem, Beta Maryam, Beta Maqal, Beta Danagel, Beta Debrasina and Beta Golgota whereas the second group Beta Amanuel, Beta Marqorewos, Beta Abba Libanos, Beta Gabriel-Rufael and Beta Giyorgis. The name of the churches called Lalibela after their most famous king who is credited for their construction. 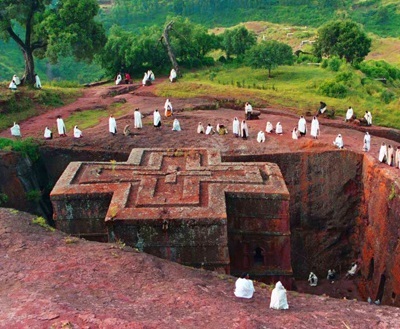 There are several rock churches in the surrounding area of Lalibela. Some of them are Yemrehanna Krestos (a built-up cave church in Axumite wood and stone construction), Arbatu Enssesa (a monolithic sanctuary which shows remains of old ornaments which were used to chisel capitals and doors in Axumite style), Bilbala Giyorgis (which a frieze with emblems of the vault decorates the facade), Makina Medhanealem (a built-up cave church in Axumite style) and Gennata Mariam monolithic rock church on a high plinth. Take your morning flight and fly back to Addis Ababa. The balance of the ay would be dedicated to do your last minute shopping and refresh yourselves at your hotel. In the early hours of the evening, be transferred to the airport to catch your return flight back to home. Fly back to Addis, do half-day sightseeing tour of Addis, and in the early hours of the evening, transfer to the airport to catch your evening return flight to home. Today you drive to Axum, which has sheltered several pre-Christian era edifices. On your way, visit gorges and admire some rural villages of north Ethiopia. Fly back to Addis, do your last minute shopping, and finally transfer to the airport in the late evening for your return flight to home.